We have three races coast to coast this Saturday in the older horses division. 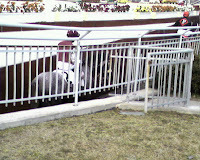 Ironically the race with the smallest purse may have the fastest horse of all in Daaher, who should be 2-5 at Aqueduct. The GP handicap is a weak field for a graded race with a $350K purse, allowance winner Sir Whimsey is the third ML choice. The Santa Anita Handicap has an interesting and large field and is by far the best race of the three. Have to give credit to Assman for his training, he has a questionable reputation in some circles but Curlin proves there is plenty of horsemanship in the Assman barn. You do not keep a horse like Curlin rolling from a syringe. Curlin has been trained smartly and it is great to see the champ come back for one more year. It was a brilliant move prepping in Dubai, Maktoum pays all the expense at the Dubai meet if you ship in and run twice. Th connections would have been saddled with costs if they prepped in the US. Not only do they take down the $175K purse, but the Sheikh pays for the plane ride, picks up the tab for the feed, the vet care, the farrier and even the grooms lunch. The Breeders Cup is going all Female card on Friday and all Male race schedule on Saturday, a departure from previous years. Race fans are not people that embrace change and this move is certainly going to be criticized. In addition the Breeders Cup distaff is now the Breeders Cup ladies classic. Between the synthetic surfaces, new races and schedule scrambling the Breeders Cup has certainly changed in the last two years. Here is a blast from the past, a 2005 romping allowance win by Bellamy Road. This lead to Bellamy Road romping in the Wood and Derby favoritism. Fast forward to 2008 and we have the handy War Pass allowance win from the other day, same barn, same run style and another possible derby favorite. Can history be at the end of the War Pass trail and not the injuries and failure of Bellamy Road? Did Zito learn from his experience with Bellamy Road? Is War Pass more seasoned and ready to make history? Bloomie is threating to close NYC OTB, it is an empty threat. Once in a while I still go to my base OTB in flushing, it is a fun place where I feel at home. My favorite part is that is is acceptable to go completely ballistic and hit the TV's with the racing form, talk to yourself and shout at the top of your lungs. These things would get you kicked out of many places and committed at some suburban mall. The joint I frequent was originally one storefront but as time went on they took over adjacent storefronts and expanded to three stores. The fun part is that all three rooms are racially segregated just like going to a jail or high school. The Original room is mixed and has the mixed bag of foreigners, here smaller groups not big enough to control a room can have a corner to themselves, the Koreans, Slavs, Greeks and Hispanics hang in here. The middle room is completely Chinese, if you are not Chinese and stay in this room it is only a matter of time before somebody says "you go now". The new big room is the English speaking room for the long time Jews and Italians that were born here. They are not shutting this thing down, it makes too much money. This is just an empty threat to gain some leverage in the NYC/Albany power play where only crisis initiates action. Today was a smashing win for Naughty New Yorker at Aqueduct. While i am not a big fan of the Statebred program this guy is as honest as they come, a real racehorse. His past performances are becoming a time machine as many of the horses he ran against as a 2yo and 3yo are now retired. What if they started Naughty New York in the 2005 derby? I think he would have had a shot to rundown the tired frontrunners in that complete pace meltdown won by Giacomo. He has now won stakes in 2004, 2005, 2006, 2007 and 2008. He has won a stakes race on each of the 4 NYRA dirt tracks. Nice job Pat Kelly and his team keeping this horse in form for so many years. Pat Kelly is quickly building a monopoly on beloved old handicap horses in New York. Here is a hidden great race from the Youtube Party Manners archive. Blistering pace with a thrilling photo finish. Got a filly in here that may turn it around today. Miss Red Delicious is the speed of the speed, take away the Synthetic races and this one is the speed of the speed. If you remember Hubley trained the dam Miss Mary Apples who was 2nd in a spa 2YO stakes, he should know this one well, the apple doesn't fall far from the tree. Value is in the exotics. Dual plays of the day. Whistlin wire to wire. Bank on it. Another play of the day. Looking for a successful stetchout for market Psychology. This one draws the rail is the absolute speed of the speed and has his eye on a wirejob at a price. I think he will get it done. Pulling a page out of his Golden Man playbook for Stormin Normandy. Richard Dutrow may run Stormin Normandy in the Hollie Hughes on Saturday at Aqueduct, then ship to Laurel for the General George on Monday. If Stormin Normandy looms large in the pace scenario of the General George. If he scratches on Monday Bustin Stones is the dominant lone speed. The A-Train will run local this weekend. Be sure to plan for extra time if you are trooping out to Aqueduct on Saturday or Sunday for the greatest sport run outdoors. Looks like the most exciting weekend of racing so far this year at least from this blogs POV. Naughty New Yorker ships out of New York for the first time to Laurel for the Campbell. Angliana also shipps down from to renew their rivalry. I still remember when they knocked Evening Attire over the rail when he raced in this Stakes 5 years ago. Rooting for all time great Samyn to get his big horse home. This is a extraordinary race for the purse and the Grade. Graded winners Dreaming of Anna, Lears Princess, Take The Ribbon and Meribel all line up for a mere $150K purse. Gomez even ships in to ride. The racing secretary is getting a ton of value for his $150K purse. Have to take a hard look here, but my first inclination would be Lears Princess. Sorry Uncle Frank. This race features the return of Derby chalk Circular Quay. Toss him and go for value. Greg's Gold might be a no-brainer, I will let you know how he feels after the Greg meetings Fri night. Big test for the undefeated Bustin Stones who is as fast as lightning. Looks like the front is all his if Normandy scratches as expected. The play of the day landed at Santa Anita yesterday with Aqu & GP on the fritz. is gave us a special oppurtunity to anayize exactly how the improvements to the track have been progressing While the card was completed it was not quite without issues. In between the 4th and 5th races there was a long delay and the tractors rolled over the track with a power apparatus to power harrow the Pro-Ride/Cushion track hybrid all weather surface. In the early races the times were blazing and maybe the jocks complained that the surfaces was baked hard and dangerous. This is the race of the day for wagering purposes as several noted money burners are signed on. You have Declans Moon who made his chops running against Giacomo in 2004, he is way over the top now but still takes loot off that ancient reputation. Another money burner is Diamond Fury, the $2.7 million purchase for Baffert has earned about a $100K and is a 7 year old, he races off a year layoff today. Les Grand Trois figures to take a ton of loot for Frankel/Gomez but this closing Sprinter does not have the pace to run at today and catches the strongest field he has ever faced. We have a pick here up top and it is #5 Tontine Too, this guy is all speed in fact lone speed in the race. Should be loose as a goose, and clear as a tear with a bunch of closers chasing him down the bakstretch. At 5-1 this is the play of the day. Reports over the wire indicate that NYRA has closed a deal with Albany and the greatest racing in the world will continue tomorrow (weather permitting). Hopefully in the language of the deal there are some changes to the revenue sharing and NYRA gets to keep some of its profits for facility improvement. More good news is that the Slot shack will only be located at Aqueduct and not Belmont, which keeps that historic facility in tact. 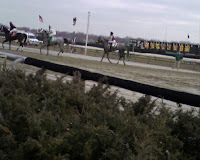 Looking forward to bigger purses and the best racing in the world, NYRA racing. See you handicappers on Saturday at our beloved Big-A. The citizens have had enough of the corruption within New York State government. It was about time that somebody or something did something. Spitzer was touted as a vessel of change but like Obama today those are clearly empty promises that are only believed by media consuming drones. NYRA is a true vessel of change and will march on Albany to demand change. Could you believe as a racing fan that of all the people, officials, companies and organizations within the state it took NYRA to lead the charge on Albany to end the corruption? After being a victim of its own poorly arranged business model and a victim of its own institutional indolence NYRA has emerged as a powerhouse of change within the state. Refusing to yield to the ineptitude of Spitzer/Silver who do not value or understand racing. Refusing the submit to the corruption of Bruno who treats racing as yet another franchise of his Sons lobbying business. NYRA has held its ground and is ready to force real change into the racing laws of New York. NYRA has the fortitude to forgo short-term profits for the long term health of the industry in New York. NYRA is taking the lead in many issues such as the broken model where all profits are rolled in the Albany corruption machine. NYRA is also taking a stand on the OTB and the parasitic relationship with racing where massive amounts of management is needed for six separate OTB regional organizations. NYRA is ensuring that the long delayed slots have a fair revenue sharing agreement in place. 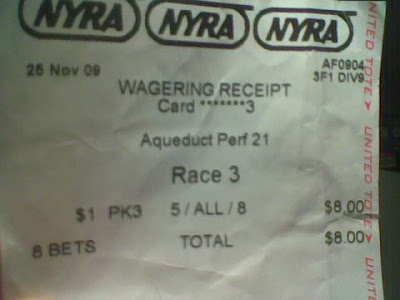 Thank you NYRA for providing the best entertainment in New York state and thank you for standing up to the corrupt regime that we live under. We as racing fans are looking forward to even better racing once NYRA cleans house in Albany. Tomcito the Peruvian derby winner has been nominated to the American triple crown. This South American mystery horse is a interesting wrinkle on the derby trail. As a 2YO in Peru Tomcito won Group I races at 10 and 12 furlongs. The big question with Tomcito is class, but if if can answer those questions like Invasor and Candy Ride we may be in for a treat. He is currently working out at Palm Meadows and posted a 100 flat 5F work today. The Peruvian connections are pointing him to the Florida derby with an eye towards the Kentucky with a more certain start in the Belmont Stakes. More from Finley on Tomcito. Love the timing of #8 River Mountain road, fits the condition to a tee winning his last race on the 11AUG. In addition the 20K win is the tops in the field so the timing edge is combined with a class edge. 10-1 is juicy and throw in 2nd off layoff form. I count three distinct edges in the elementary form factors. A true play of the day. We had some harsh tongue in cheek criticism for Santa Anita the other day. However the first day of the pro-ride/ Cushion hybrid seemed like a success. The runaway obscenely fast times were under control, there were no breakdowns and the texture of the track looked different. Thye racing was form ful with no visible bias towards closers or speed. The real test will arrive with precipitation but I would bet that this fix is a success. Congratulations to Santa Anita for working through a difficult issue. Perhaps the entire industry learned something from Santa Anita's folly and that may be a good thing. Aqueduct race 1- #4 Holly Time has every edge a sprinter could imagine. Speed edge, class edge, lone speed and fits the condition to a tee. The price will be short but this one fits into the lock of the day category. A pure percentage booster. Santa Anita was awarded the 2009 the Breeders Cup yesterday. Was this a reward for running this meet so well? Maybe this was a good pick me up for the besieged Santa Anita management but the timing is interesting. How could a track be awarded a Breeders Cup when they do not have a viable surface? Maybe it is a safe assumption that the lack of a surface will be sorted out by 2009 but how can there be a safe assumption after the infamous assumption that cushion track would install a safe surface last year? Maybe this is not all Santa Anita's and Magnas fault. Maybe they are just victims of the evil English Cushion track. Did you know Cushion track is headed by an English descendant of Benedict Arnold? Here we are hundreds of years later and the Arnold's are still taking out their revenge on the Yanks. How would Santa Anita management know that they should have held the company that builds its track accountable for the racing surface they were installing? Do you think airlines make sure that the airplanes they buy are airworthy? Of course not they just assume they will fly. So why should have Santa Anita ensured that the new formula installed by Cushion Track was race and weather worthy? What about the awful weather of California? It is easy for a blogger from New York to marginalize the brutal weather conditions of winter in California. There was a reason the Japanese where interned in concentration camps in the Santa Anita infield, with the weather this year we are seeing the one of the reasons clearly illustrated. When you think Santa Anita it is the equivalent of being sent to Siberia. The temp dropped below 70F at Arcadia last week and it rained twice this month, how do you expect them to run under such conditions? Absolutely unlivable conditions for California. Under Santa Anitas master management they only 12 of 32 days to weather issues. Add it all up and Santa Anita deserves to present the BC forever. Why just stop at the BC? Magna deserves to be rewarded. As a testament to their genius Santa Anita should have been awarded the Miss America pageant, the national spelling bee and the Eukanuba Dog Show in Addition to the BC yet again. Not only is Pablo Fragoso a live longshot jockey but he is also one heck of a sports handicapper. He nailed not only the winner, but the winning margin and the winning score of the superbowl. To me that is more impressive than catching a ball with your helmet. Well done Pablo. Chunk of Love the $25K claimer/sprinter was featured in a Super Bowl Ad with a new Jockey. If you do not know who Chunk Of love is here are her lifetime PP's. Glad that Vitamin Waters founder Mike Repole is using the appeal of racing to sell his beverage. This ad benefits horse racing just as much as Vitamin water benefits from the national media exposure. Repole is a big owner and lover of the game. The ad features an apprentice with a weight issue who somehow gets his horse up in the lane with the aid of vitamin water. After watching this I'm chucking that gator garbage in the rubbish and going with the Vitamin water. Spent Saturday at the Big-A, and took some rather poor shots of the Whirlaway entries in the paddock, which I will bore you with. Even more boring is a rant about public transport and another post about how much race fans love going to the track. One of my favorite things about the Big-A is that the subway stops a few hundred feet from the main entrance. It brings me great pleasure to ride the rails from my home to my favorite place in my favorite borough, reading my favorite newspaper while I try to beat every favorite in sight. The time flies, it is relaxing and I enjoy sitting shoulder to shoulder with my working class compatriots. This weekend however the train ride was extended by 40 minutes due to track work. Not only did I miss the opener, I missed cashing the early double thanks to the MTA. 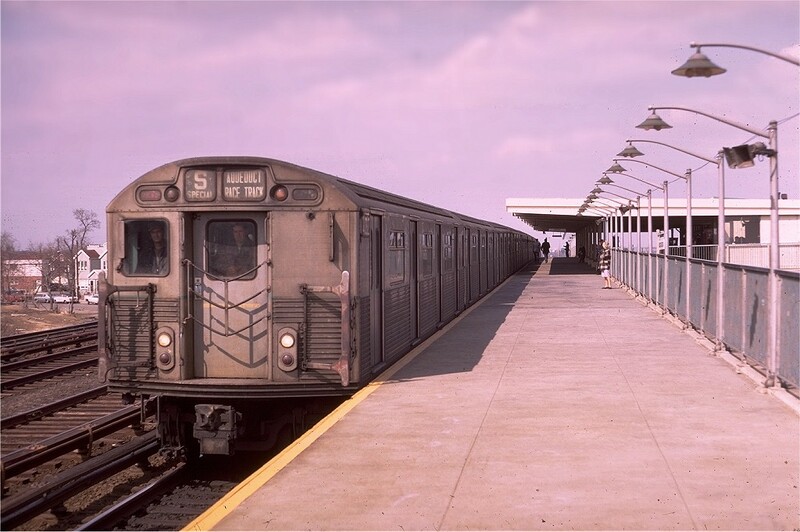 The A train from 168th street is express and makes occasional stops southbound from uptown Manhattan to South Ozone park. 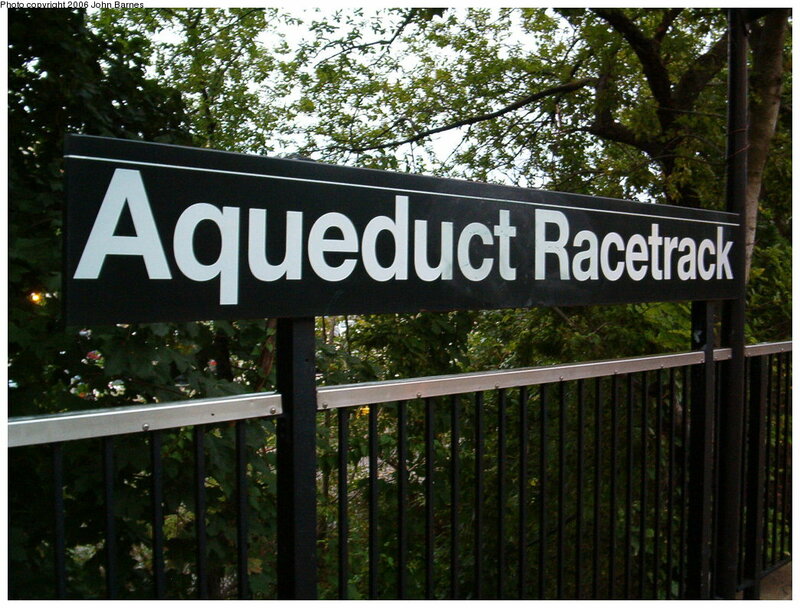 However on Saturday the A train was local all the way from 207st to the Aqueduct station. When the train is express it is a somewhat long 45 minute ride with 15 stops. On Saturday with the express trains canceled the all local A-train was an eternity with over 40 stops and 1 hours 30 mins from where I get start my trip on the #1 line in the Bronx. Next time if I or anyone else intends on taking the A-train on the weekend they should check the MTA website for work information. While many complain about the racing and the empty grandstand at the Big-A I am one of those that relishes the NYRA winter product. Why does the public stay away? Scenes like the empty grandstand pictured here should only be seen on dark days. How could it be that someone like myself who loves the Big-A is so unique. Where are the other racefans? Out of 20 million metro area residents only 4,000 could find their way to the Big A on Saturday? While many try to gain an edge on the confusing mishmash of shippers at Gulfstream I prefer the cozy confines of the almost closed circuit at the Big-A. While many are looking for a challenge, the Big-A keeps it simple, as there are basically two distances (6F & mile 70 yards) on a very biased surface, which further weeds out the losers. One factor that makes the inner track easier to handicap than some other tracks is at the Big-A a given class of of race usually features a very familiar cast of characters with very plain form. While certainly not top class racing I feel that the Big-A is the most formful racing all year. After a challenging Gourmet like offering of Saratoga and the fall championship meet/Breeders Cup the Big-A is like going home to eat a well rounded home cooked meal. Not flashy, but nourishing, tasty and very familiar. The inner track is something I look forward to all year and something that gets me through the long northern Winter. Barrier Reef won the Whirlaway after stalking the pace and outgaming Roman Emperor in the lane. Perhaps these two are on the triple crown trail now, they seem like they could get the ten panels of the derby. Wouldn't it be nice if they never changed the names of Stakes races? So many Stakes with long histories have been changed in the last few years. The Paumonok history posted on Brooklyn Backstretch was fascinating and honored a people that lived on long Island long ago. Yet a race like this could be changed to the Silver Train next year to honor a recent Grade I winner. NYRA has a great database of race winners/Jockeys/history posted on their website. Many races trace their roots to the 1870's in New York and it would be a disrespect to those that toiled on the backstretch before us to change the name of races. 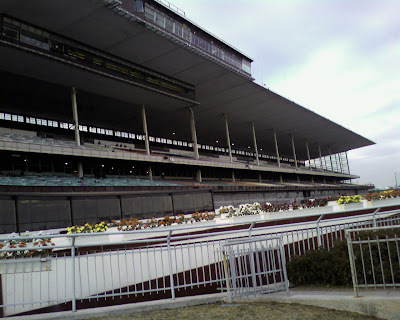 We learned a few years ago that racing in the United States traced its roots back to the Hempstead Plains in 1665 yet the Hempstead Handicap was removed from the schedule in favor of the Phipps Handicap. While Phipps was a great man I do not think he should be honored at the expense of History. Racing fans are a unique lot that are notoriously not fond of progression in a time where people are obsessed about today, themselves and nothing much else. While the promise of a new day and a new race card is something that inspires us it is now all we live for. Each new crop of horses holds the promise of the future and the possibility of a new freak, but perhaps most of all we cherish the past and the long storied history of racing. Floral Park Stakes - Unknown??? Daaher is the chalk and the play of the day. Should be dominant from start to finish to log his 2nd Grade I win. The works are exceptional and there is no reason to play against this legitimate favorite. The power play will land on the chalk today. Travis Stone and crew have recently re-vamped the racing dispatch website. What was once a list of links to news stories, has been transformed into a interactive news portal where individuals can post their own stories and comment about stories posted in the mainstream media. This site functions as both a tool and a resource. While racing is somehow pigeonholed as an old mans game it has its edges over the mass appeal ball sports in the modern era. One of the modern strengths of racing is that the internet can be used as a tremendous resource for the savvier, smarter racefan. In comparison the drone like ball sports fans are usually found sprawled out in a catatonic state on the couch, plugged in to the TV, while the racefan sharpens his/her mind analyzing past past performances. Racing dispatch seems to be capitalizing on racings strong presence on the internet, highlighting opinions from the fans and allowing them to be part of the action. The racing fan appreciates his/her opinion being valued and the Racing Dispatch offers the fan empowerment. Travis is one of the young stars out there in the racing media, his potential is unlimited. The racing dispatch and his crew bring new, fresh ideas to the electronic racing media.